Since 2011, the international media have done much to highlight the suffering of civilians in the on-going war in Syria, including through innovative forms of reporting such as VR journalism and news games. However, by the end of 2016, questions were being raised about a number of high-profile news stories, such as the use of chemical weapons, the role of the ‘White Helmets’ relief workers, and the bombing of Aleppo and other cities. Amid the claims and counter-claims of propaganda and ‘fake news’, news audiences glimpsed shifting and clashing explanatory framings of the Syrian war. A conflict that had initially been understood against the background of the ‘Arab Spring’ began to be seen as complicated by sectarian religious tensions, the rise of Islamic State, opaque factional and regional alliances, and international tensions reminiscent of the Cold War. 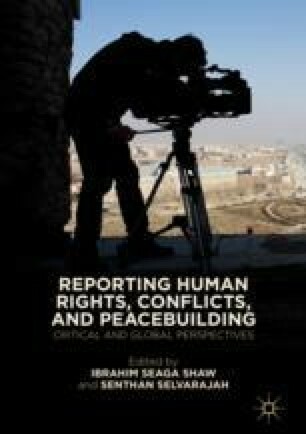 An imperative to establish a moral framework for the story seemed to preclude more complex and searching questions about the motivations and actions of local and international actors. Abrahms, M. (2017, October 30). Syria’s Extremist Opposition: How Western Media Have Whitewashed the Rebels’ Record. Foreign Affairs. Retrieved from www.foreignaffairs.com/articles/middle-east/2017-10-30/syrias-extremist-opposition. Allday, L. (2016, December 13). Controlling the Narrative on Syria. Monthly Review. Retrieved from https://mronline.org/2016/12/13/allday131216-html/. Blumenthal, M. (2016a, October 2). Inside the Shadowy PR Firm that’s Lobbying for Regime Change in Syria. AlterNet. Retrieved from www.alternet.org/world/inside-shadowy-pr-firm-thats-driving-western-opinion-towards-regime-change-syria. Blumenthal, M. (2016b, October 2). How the White Helmets Became International Heroes While Pushing US Military Intervention and Regime Change in Syria. AlterNet. Retrieved from www.alternet.org/grayzone-project/how-white-helmets-became-international-heroes-while-pushing-us-military. Chen, A. (2018, February 22). A So-Called Expert’s Uneasy Dive into the Trump-Russia Frenzy. The New Yorker. Retrieved from www.newyorker.com/tech/elements/a-so-called-experts-uneasy-dive-into-the-trump-russia-frenzy. Cockburn, P. (2017). Who Supplies the News? London Review of Books, 39(3). Retrieved from www.lrb.co.uk/v39/n03/patrick-cockburn/who-supplies-the-news. Conflict Armament Research. (2017, December). Weapons of the Islamic State. London: Conflict Armament Research Ltd. Retrieved from www.conflictarm.com/publications/. Dejevsky, M. (2018, March 1). Two Views of the Syria Conflict that Seem Never to Meet. Valdai. Retrieved from http://valdaiclub.com/a/highlights/two-views-of-the-syria-conflict/. Foreign Affairs Committee. (2016, September 14). Libya: Examination of Intervention and Collapse and the UK’s Future Policy Options. Retrieved from https://publications.parliament.uk/pa/cm201617/cmselect/cmfaff/119/119.pdf. Gambill, G. (2012, August 23). Two Cheers for Syrian Islamists. Foreign Policy. Retrieved from http://foreignpolicy.com/2012/08/23/two-cheers-for-syrian-islamists/. Gibbs, D. N. (2015, July 6). The Srebrenica Precedent. Jacobin. Retrieved from www.jacobinmag.com/2015/07/bosnian-war-nato-bombing-dayton-accords/. Glass, C. (2015, October 22). In the Syrian Deadlands. New York Review of Books. Retrieved from www.nybooks.com/articles/2015/10/22/syrian-deadlands/. Gordon, P. (2015, September 25). It’s Time to Rethink Syria. Politico. Retrieved from www.politico.com/magazine/story/2015/09/its-time-to-rethink-syria-213184. Hanrahan, J. (2016a, April 11). As in Libya, Avaaz Campaigns for Syria No-Fly Zone That Even Top Generals Oppose. Common Dreams. Retrieved from www.commondreams.org/views/2016/04/11/libya-avaaz-campaigns-syria-no-fly-zone-even-top-generals-oppose. Hanrahan, J. (2016b, April 13). Avaaz Ignores Libya Lessons in Advocating for Syria No-Fly Zone. Expose Facts. Retrieved from https://exposefacts.org/avaaz-ignores-libya-lessons-in-advocating-for-syria-no-fly-zone/. Higgins, P. (2015, August 27). The War on Syria. Jacobin. Retrieved from www.jacobinmag.com/2015/08/syria-civil-war-nato-military-intervention/. Lister, C. (2015, May 5). Why Assad Is Losing. Foreign Policy. Retrieved from https://foreignpolicy.com/2015/05/05/why-assad-is-losing-syria-islamists-saudi/. Lund, A. (2013, March 16). The Free Syrian Army Doesn’t Exist. Syria Comment. Retrieved from www.joshualandis.com/blog/the-free-syrian-army-doesnt-exist/. Lynch, M. (2012, February 9). The ‘Arm the FSA’ Bandwagon. Foreign Policy. Retrieved from http://foreignpolicy.com/2012/02/09/the-arm-the-fsa-bandwagon/. Mason, J. (2018, February 26). Researching Politically Sensitive Topics. Medium. Retrieved from https://medium.com/@jakekmason/researching-politically-sensitive-topics-7cdb00f7c27e. Matta, N. (2015, December 17). What Happened to the Arab Spring? An Interview with Gilbert Achcar. Jacobin. Retrieved from www.jacobinmag.com/2015/12/achchar-arab-spring-tunisia-egypt-isis-isil-assad-syria-revolution. Oberg, J. (2016, November 1). Just How Grey Are the White Helmets and Their Backers? (TFF PressInfo #392), TFF Associates & Themes Blog. Retrieved from http://blog.transnational.org/2016/11/tff-pressinfo-392-just-how-grey-are-the-white-helmets-and-their-backers/. Ritter, S. (2016, October 5). The ‘White Helmets’ and the Inherent Contradiction of America’s Syria Policy. Truthdig. Retrieved from https://www.truthdig.com/articles/the-white-helmets-and-the-inherent-contradiction-of-americas-syria-policy/. Solon, O. (2017, December 18). How Syria’s White Helmets Became Victims of an Online Propaganda Machine. Guardian. Retrieved from www.theguardian.com/world/2017/dec/18/syria-white-helmets-conspiracy-theories. Syria Campaign. (2017, December 20). Killing the Truth: How Russia Is Fuelling a Disinformation Campaign to Cover Up War Crimes in Syria. Retrieved from https://diary.thesyriacampaign.org/killing-the-truth/.